Delayed F-20 ends up going with PW1120, same as Lavi? Or Northrop buys into Lavi (that was definitely looked at) either as a co-developer or as the US lincensee? I do like either a PW1120 "F-20" (or perhaps the same in the Mirage F.1 or even Mirage 2000). The NG Lavi would also be very cool. As I said above I think a lot of the selection comes down to whether the need is ground attack centric or air to air centric. Another thought: there was a proposal for a big-wing Jaguar knocking around in the early 1980s, which had more power and much better agility. Another option out of this is that we see a European design fill the hole left by the F-16. 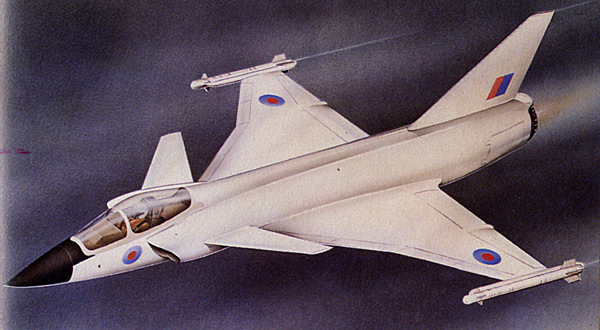 Maybe one of the late '70s/eary '80s British Aerospace designs? Maybe a joint European project involving British Aerospace, Dassault, MBB, Saab etc to create something akin to the Gripen. There were certainly many lightweight fighter looked at and this could be a good follow on project for the likes of the Panavia consortium. Maybe even something around a single RB199 engine? In fact, the RB199 might provide an interesting gap filler also if the F404 wasn't available now - RB199 powered F-20 anyone? Keep the thrust reversers from the Tornado as well to satisfy the likes of Swedish STOL operations. I would say the 37E "Eurofighter" variant of the Viggen gets developed and at least Norway and Denmark operate it. Maybe the increased prevalence of Viggen in the neighbouring countries will cause Luftwaffe to re-evaluate their "no single engine plane after Starfighter" policy? Also, BAe did contribute to Gripen design, so it would not be so strange to see them contributing to the Viggen Eurofighter already. Sea Viggen? The landing gear was already stressed for carrier-grade sink rates, the automatic landing system placed the plane on a runway with the accuracy that would have been good enough for carrier landings, the rudder folded already, and corrosion prevention was probably also pretty good considering it had to withstand outside parking in Nordic winter, so "only" catapult fittings and arrestor hook were missing (yes, I know, navalizing an aircraft is not that simple outside whiffverse, and for example, the thrust reverser would have been so much dead weight on a carrier aircraft). F-20 proliferation is also a certainty, given that Northrop was going to develop an update for the F-5 series anyway, LFW or not. Of course, Vought might actually find customers for their A-7F StrikeFighter too. With no F-16 sales to be endangered, Lavi goes forward too. If the Hornet is also absent, I see Canada and Australia definitely going for either F-14 or F-15. Maybe the USMC will also get to keep their almost-realized 'Cat squadrons? Naval variant of A-7F is a given, unless it's a naval machine to begin with. Spain and Finland, anyone's guess. Switzerland, depending on the year of decision, either Viggen or Gripen, or even AV-8B+ Harrier. "Sea Viggen" with a new nose gear that includes the bar for the shuttle? Might be simpler than adding structure properly for catapult bridle fittings. Whatever was done with the F-20, I could see the production version having to have a bigger wing, Perhaps first of all there could have been the variant Northrop's support engineering organization put together with enlarged wing with additional hardpoint on each side and power from two GE J97s. Oh, another thought for F-20, if the YF-17 existed but the F/A-18 never came into being, I could see the F-20 using the J101 from the YF-17; not as large or powerful, but available. There were in fact many studies done on various "half Tornados" with single RB.199s and either fixed or VG wings and with and without afterburners. It's likely that if one had been adopted, it would have taken the place of the AMX, and in fact been very similar to it, just with more power. 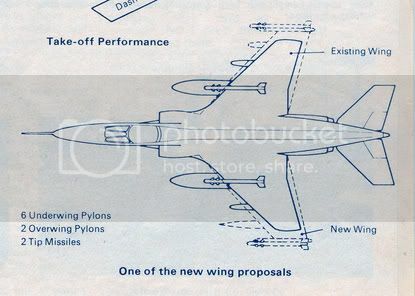 Britain looked at some tasty lightweight fighters too, with Brough's P.153/P.159 projects being in the right timescale and very doable, involving no structural techniques beyond those of the Jaguar/Tornado, the Buccaneer's blown wing and a single RB.199 with a thrust reverser. In reality, nothing like this could have been developed in the UK alone in the same timeframe as the F-16 because the Tornado programme ate up all the available funds until the mid 1980s, and by then we were into the Eurofighter. A joint project by Panavia might have been possible, but the Panavia nations wern't the potential F-16 customers, so why would they? 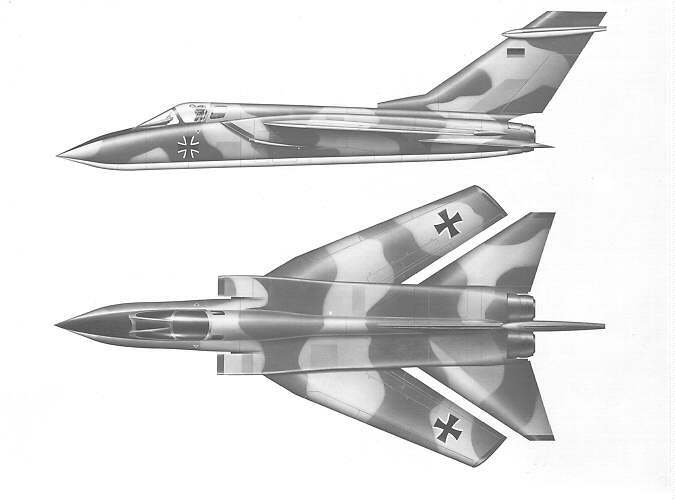 What is interesting is that the initial MRCA discussions involved Canada and the European F-104 consortium. With Tornado too expensive for all the latter except Germany and Italy (and they held out for ages for a cheaper single-seat CAS version of the Tornado) and no lightweight US fighter in prospect, might the F-104 consortium have been persuaded to build something like the P.159 as part of an expanded, two-aircraft Panavia consortium? The choice for the F-104 group might therefore have been between the Panavia option and the Mirage F.1-M53 rather than between the latter and the F-16 as it was in rela life. It's hard to imagine Dassault and British Aerospace in the same consortium in the 1970s following the AFVG debaclé and Dassault's attitude problems with the Jaguar when they took over Breguet. Enjoying all this immensely! Lot of great ideas all around. I had not considered how the nature of the LWF not happening would also change the outcomes. I suppose anything is possible when you remove the a top seller from a potentially crowded market. I know the Light Fighter Mafia were also the champions of the A-10 but even the most ideologically impaired individual would have to have seen there was a need for all weather air superiority and strike, the USAF would pretty much have had to buy more F-15s as well as acquire either a specialist strike aircraft or a fighter bomber to supplement the light fighter. Start buying extra F-15s and strike fighters to do what the light fighter cant and the whole cheap part of the equation goes out the window, as too would most export sales as many nations could not afford split fleets and needed multi role aircraft. Best outcome I could see is the F-14B and C would likely have survived and seen very long and productive service, as well as improved follow on derivatives with the F-14A being nothing more than an interim. Likely the light fighter and attack requirements could have been met by evolved A-7 and V/STOL, perhaps an evolved Sea Harrier type for USN as well as USMC service if the more ambitious options proved to great a stretch. Maybe the SCS would have survived, or even an evolved through deck Strike Cruiser. The F-16 didn't just change the marketplace, it also profoundly changed thinking across a wide variety of air forces too. For instance in the early 1970s, the next RAF requirement was AST.396 which was written around a common Jaguar/Harrier replacement in the CAS/BAI role for the mid 1980s. Low price, low risk and rough-field/STOL capability were all high priorities. A lot of the resultant proposals were very unsexy, with the high-end being roughly equivalent to the AMX and the low end having little more capability than an armed trainer. Then the F-16 came out, and the RAF were somewhat startled to realise that you could now combine the kind of attack capability they were looking for with an agile dogfighter in one airframe. Their thinking shifted radically, and AST.396 was replaced with AST.404 which relaxed airfield limits and called for a BIG increase in maneuverabilty. STOVL was hived off into AST.409 (?) for a separate Harrier replacement that became the AV-8B/GR.5. The Germans were thinking along the same lines, and, combined with the good working relationships developed over Tornado, this lead to the genesis of the Eurofighter programme. Without the F-16 or something like it to change minds and paradigms, would this shift in thinking have ever occured, or would the European air forces continued to be obsessed with buying large volumes of cheap light attack aircraft to blunt the projected Soviet land attack? That lead to an intriguing thought. The F-15 was extensively promoted in Europe and a stretched version of the Tornado was proposed to the USAF. With no F-16 to undercut the F-15 and divert European attention from Tornado, might a deal have been cut whereby European air forces bought the F-15 in exchange for the USAF buying the Tornado? The USAF had excellent reasons to want something like the Tornado for strike operations in Europe, it was a high quality product that already incorporated a degree of US hardware, and 'Americanising' it to fit US requirements should have been straight-forward. On the European side, Germany and Italy could certainly make a good case for buying the F-15 to replace the F-4F and F-104S and with a European manufacture and support infrastructure in place (and subcontract work to be won), smaller nations might also have been persuaded to take it on a 'common fleet' basis. The Netherlands and Spain seem like good candidates for this. The only fly in the ointment would be the UK's Tornado ADV programme. The proposed US Tornado used the ADV's stretched forward fuselage, so if the Eagles-for-Tornados deal was done after it was launched, and the UK was pressured into swapping over to F-15s, then the quid-pro-quo might have been that the UK would use it's now redundant ADV jigs to build the forward fuselages for some or all of the USAF Tornados. Alternatively, BAC could just hand over the ADV fuselage jigs to McDD in exchange for UK contracts to adapt the F-15 to RAF requirements. An optimised 'F-15K' would be based on the F-15B airframe with UK-redesigned cockpits for a pilot & RIO, a retractable refuelling probe instead of the boom socket, and possibly the Foxhunter radar, either from new or as a future mid-life upgrade (I know that in practice Foxhunter had problems, but those were in the future at the time that these decisions would be made in the late 1970s). The availability of this option might also help F-15 exports to other countries too (Canada, for example). Absent a Navy variant of the LWF, or something else to drive development of the J101/F404, development of the F101DFE/F110 would be delayed because that rolled a lot of tech and knowledge from the F404 onto the larger F101 core (heck, on a non-dimensionalized basis, the F404 and F110 have the same contours). That could cause delays to developed F-14's, especially if the F401 continued having problems and picked up more in common with its F100 sibling. I could see Allison actively pitching a developed afterburning variant of the TF41 as a replacement for the problematical TF30 in the F-14A and this engine being available for other efforts. Yet another possibility is that the Mirage 2000 takes more orders that the F-16 got in reality.